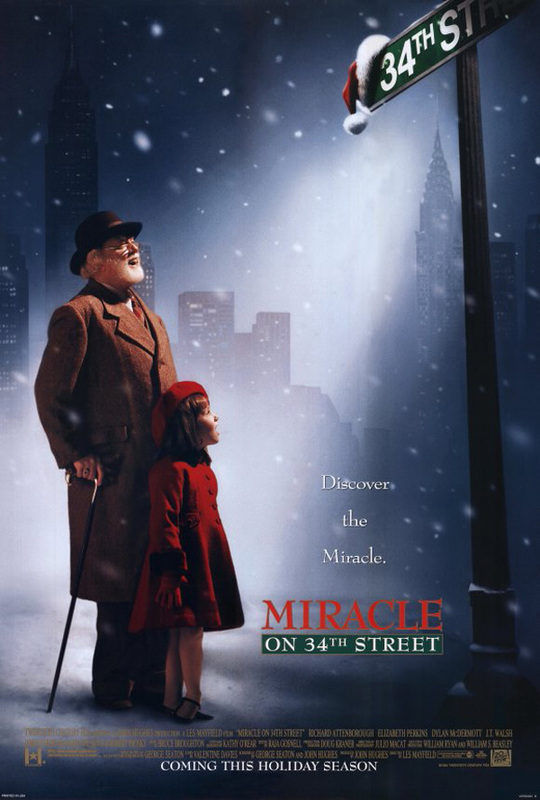 Having never seen a version of Miracle on 34th Street, I figured now, when I’m in my late 30s, would be the perfect time to catch up. I still believe in Santa Claus, or at least the spirit of Santa anyway, and that’s more than six-year-old Susan (Mara Wilson) can say. She thinks we’re just a bunch of gullible fools, and she’s not impressed when her mother, Dorey (Elizabeth Perkins), the head of events for a large department store, hires a very realistic Santa (Richard Attenborough) for the holiday season. Despite his efforts and those of Dorey’s boyfriend, Bryan (Dylan McDermot), she just can’t seem to get in a Christmas mood. I can see where Susan is headed, and it’s straight for the Hallmark Channel. She’s going to grow up into one of those women who hates Christmas because of a traumatic childhood, only to rediscover its joys after a hot guy enters her life. Mara Wilson, the cutest girl onscreen in the 90s, has a soulful sadness to her in this film, and Susan looks like a girl who’s been having an existential crisis for some time. She worries that Cole’s, the department store where her mother works, is going to be bought out and turned into a junk store, and when Bryan starts asking her about getting presents from Santa, she gives him a hard stare that says, don’t talk to me like a six year old. I love little Susan and pint-sized Mara. Susan wants to believe in Santa so badly, but her cool, practical mother just won’t have it. Dorey even puts her relationship with Bryan on the line by insisting he stop encouraging such fanciful thinking. But Bryan is a dreamboat and all-around good guy and does what he can to give Susan a more magical Christmas experience, including a visit to Santa where her skepticism starts to fade. She concedes that the Cole’s Santa does look like the real deal and is bewitched by his beard and costume, but she really starts reconsidering when she spies Santa sharing a touching exchange with a deaf girl. The movie is far less holly and jolly than I expected, and it seems more like a film for cynical adults than it is for bouncy kids. It doesn’t have the energy of Home Alone or the adventure of Arthur’s Christmas. Some will surely be bored by aspects of the plot, like when a competing store schemes to kidnap Santa and turn a profit. This results in the arrest and trial of Kris Kringle, and his release depends on a legal argument about the abstract concept of belief. If I was a kid, I’d much rather watch A Christmas Carol, any of them. Miracle on 34th Street has its appeal though, and it’s thanks to the actors who really inhabit their roles. To this day, I think of Attenborough when I think of Santa Claus. McDermott is the perfect boyfriend and the perfect complement to Perkins. The movie is as much about Dorey as it is about Susan. The latter knows what she wants – a childhood filled with family and wonder. It turns out that Dorey wants that too; she just doesn’t realize it yet. Posted in USA, Western movie reviews and tagged Christmas movies, drama, Dylan McDermott, Elizabeth Perkins, family films, Mara Wilson, Richard Attenborough on September 6, 2018 by limmer13.